Among the traditional Gikuyu, when a child was born, it took about three to four years sometimes even five for it to be weaned from its mother. The first separation of baby and mother was done by the midwife when she cut the umbilical cord. Between that first birth and the second, the mother carried the child everywhere she went and if need be had to carry it even on top of her other loads. On very very rare occasions would she let the child out of her sight and then only under an elder daughter and never with a co-wife or stranger. The child after it learnt how to walk always tagged behind its mother’s leather dress and usually would never let go and would hide between her legs under the long dress when a stranger was talking to the mother. The strong bond between child and mother was only broken after an elaborate ritual ceremony of the Second Birth also called “Returning the child into the womb”, Gucokia mwana ihu-ini. The Second Birth was important for several reasons. Up to that point, about three to four years, the child’s Soul was in formation and could not take on any responsibility for sin. Any sin and the misfortune arising therefrom, thahu, was the parents’ responsibility and they were the ones who would undergo the purification ceremony for the sin, thahu. The Second Birth ceremony was therefore the real birth of the individual ego. Henceforth not only did the child become responsible for its own destiny but it shed any inherited sins of its parents. It is after the ceremony that a child graduated from its first stage of child, mwana into becoming either a Kairitu, girl or a Kahii, boy. It does not mean he or she was a generic genderless being but he was a mwana wa kahii, and mwana wa kairitu. The child after that could be sent, for instance fetch such and such item from so and so. The child and also the mother take the difficult step of disengaging themselves from each other. She could then have another child. Women who had children on top of each other before the previous had graduated were thought to be irresponsible women without planning and their husbands worse like they could not afford to have other wives. It was a planning thing. The child could be allowed to sleep in another house away from the mother. Before that it could never be allowed to sleep out with relatives. Even more, the child could leave its mothers bed and sleep in the Kweru for a boy and in the girls’ bed, Kiriri for the girl. I say could because getting the privilege of sleeping in the girls’ bed, Kikiri required the consent of the older girls. The ceremony itself was a very elaborate affair and would take pages and pages to describe. I urge readers to get themselves a copy of Stanley Kiama Gathigira, Miikarire ya Agikuyu or Mathew Njoroge Kabetu Kirira kia Ugikuyu. Gathigira gives the Nyeri, Gaki version of the ceremony and Kabetu the Kabete version. Briefly, the ceremony required the use of the original half calabash that was used to wash the baby after it came from its mother’s womb and a new calabash, a fattened ram which the woman had to take to the river and have it dip its forelegs into, and eight leaves collected from the bush by children; four leaves of the Mukenia and four leaves of the Mutei for a total of eight leaves. The woman had to collect soil from the hoofsteps of the ram into the calabash. All these were brought to the man who then slaughtered the ram and its innards mixed with the soil. The child then dipped the leaves into the mix and smeared the mother. The highlight of the ceremony was an enactment of childbirth compete with labour pains. The intestines of the ram were tied between mother and child and the climax of the ceremony was the cutting of this ritual cord. 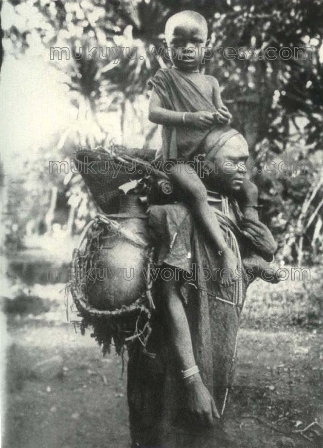 After this, the woman and the child were clean shaven to look like the calabashes. The ceremony also involved the use of the four secondary spaces in a Gikuyu Nyumba, woman’s house. The main central space with a three stone hearth at the centre. Four Primary Spaces forming a cross outside the square but inside the circle of the Nyumba’s circular wall. 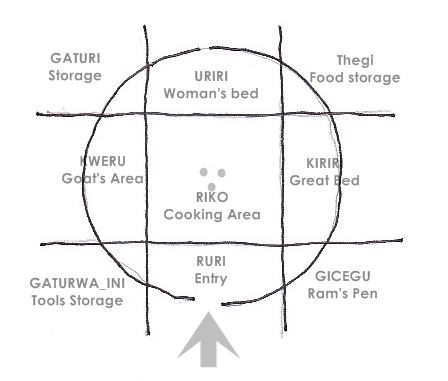 The Entry, ruri, The Goats Area, Kweru, The Woman’s Bed space, Uriri, and the Great bed, Kiriri. The Primary and secondary spaces are eight and there are four twice leaves – eight for the ceremony. The main rafters holding up the Kikuyu cone roof were always eight. The hooves of the the ram are eight as each leg has a pair. The old calabash of the primal birth and a new calabash signified the split between the new life and the old. If they were put together they are complete as a circular container, womb made of old and new, mother and child. The Nyumba is a container of the Gikuyu Soul. The center is the navel. Umbelico del mondo, or the navel of the world. This ceremony was one of the first to be attacked by the civilizing missionaries and this resulted in its abandonment. Because polygamy also came under attack the direct result was the loss of control which women had over sexual matters and they started bearing children every two years and sometimes yearly. Women became physically devastated and have never quite recovered. Very good indeed, very enlightening. These articles are an eye opener for my doctoral research. A rich document to read.